BOONTA (formerly KO VARI), Dernatine System, Sulorine Sector (Grid S-8, 180.180.-2). The fourth of seven planets, this terrestial planet originally settled by the Hutt Cartels (#ref 39002-1284) approximately 28,000 ABY in the Early Hyperspace Age (#ref 23-123). Boonta's surface, population and technology were devastated twice during it's recorded history, during the wars of the Kingdom of Cron (#ref 39002-0012384) (see Xim the Despot), and again by the Galactic Republic (#ref 39002-129304) the Great Sith War (#ref 99938-32291). In current millenia, Boonta has developed into a regional trading hub. Despite historical catastrophies, Human Colonists constitute the bulk of the planet's population. The major population and industrial centres contain populations that cross-reference a number of the Galaxy's species, most notably the Hutts. The population is spread throughout the planet. Technology: Boonta's technology meets the galactic-standard rating of advancement; both rural and urban areas contain high levels of advanced living, from droids to transportation networks. Most high technology is centered around the capital, the starport city of Ko Katana, and the industrial centers. Politics: Boonta's position on the Salin Corridor and the Lesser Lantillian Route give Boonta a Class 3 Strategic and Class 2 Economic rating. As a result while Boonta is nominally Independent, the Hutt ruling class continues their historic influence of the affairs of Boonta. Far off the regular entry vectors to Boonta, and high above the tan and orange planet itself, the Claw lay powered down, again nearly dead and adrift in space. In the hold, Cragus 12 was finishing the repairs to his suit, and one by one, reattaching them to his bodyglove and neurocircuits that interfaced the part to his body. Lights on the suit modules flared and beeped green as they powered up. After several weeks travelling the back routes and avoiding attention, he had made his way to the Boonta system to meet the Jedi Knight Calrissian had set him up with. Cragus considered his options. He always hunted a bounty solo, and the Jedi Knight could prove to be a nuisance or a dangerous distraction. At worst, Calrissian had set him up to be trapped by the Knight. On the other hand, if this wasn't a trap and indeed a legit bounty, traveling under the cover of a Jedi Knight through Republic, the Empire and the Union would make the search far easier. The ship broadcast a proximity alarm on the passive sensors. A ship was coming out of hyperspace on top of the Claw. Cragus, expectant but alert, moved to the bridge of his light freighter and silenced the alarm. Taking his seat, he powered up the active sensors and moved the ship over to full power. Amidst the rising whine of electronics and machinery, he saw a ship slide out of hyperspace only a few kilometres away. The ship, a type of light scout, slid out of hyperspace and came to rest quite close to the Claw. Cragus, taking his chances, powered up his shields and weapons and was ready to punch his engines into full thrust. He flicked at the comm. A flat screen flared to life, showing a Bothan of middle-age. He hair was worn long, and several of the locks around his ears were braided. His feline eyes were golden, and his with flecks of violet. He wore a simple brown tunic that covered his shoulders and torso, while a softer shirt white worn under the tunic covered his arms. "Greetings. This is the Claw, I presume? I am Jedi Corask of the family Slen, of Clan Da. Let us continue to the meeting point. I will see you at the Races." A last blast of dust blew around the Pathfinder's landings struts as Slen'da eased off on the repulsors, and settled the Scout ship on it's landing struts. 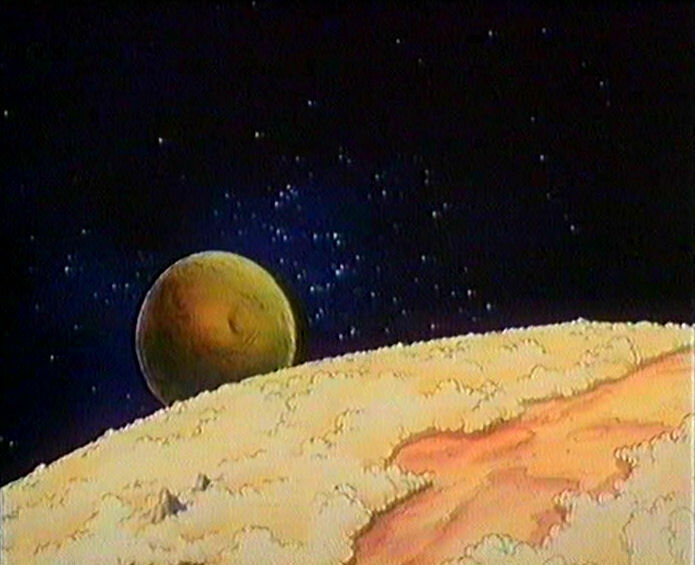 As he powered down the ship, he took in the planet. Despite being a semi-arid planet, Boonta was still a pleasant world. The light brown sky contained puffs of darker brown cumulus clouds, and the Sun shone pleasantly upon his face. Beyond the grey industrial gantries and launchpads of the commercial port lay the haphazard skyline of the Boonta City metropolis. As he exited the hatch to meet planetary Customs and the docking crew, the light breeze brought warm air and momentary scents from the plains that lay beyond the Starport. Slen'da made his way out of the Starport and joined the columns of pedestrians coming to and from the City. Asking directions several times, he made his way towards a conical zigurat, massive in size and blueish-grey in colour. As he got closer, he found he was moving with the throngs towards the wide entrances at the base of the zigurat. "Welcome to the Boonta Speeder Races! Qualifying rounds begin will begin at the noonhour!" Loudspeakers repeated this in a variety of languages. As he made his way through the crowds and queues to the ticket counter, he mentioned his name. "Yes sir, a reservation has been made in your name. The Baron-Administrator hopes you enjoy the experience." Slen'da nodded to himself; Calrissian would have made a good Bothan. He certainly loved his double meanings and mind games. All Calrissian told him was a name and a description of Cragus 12, but a New Repubic Intelligence search on the bounty brought up, well, a sordid history. Several New Republic arrest warrants made out for Cragus 12, as well as a number of deathmarks, bloodprices, and "seize and detain" orders from systems stretching throughout the Outer Rim. 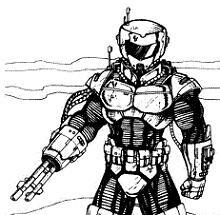 This bounty hunter was a dangerous human-cyborg, a true killer. Not for the first time since he made the inquiries Slen'da wondered what he was getting out of his bargain with Calrissian. But as a Jedi with an oath to fulfill and a Bothan with vengeance to satisfy, he resolved to keep an open mind. He made his way up the stands an into the private viewing boxes. He entered the door marked "Reserved for Tenadro Industries" and into the room. It was spacious, quiet, dark and cool. He was apparently the first to arrive; Cragus probably had problems with Customs, Slen'da thought with a snort. Lined with rich carpets and wood, and tables stood off to the side with refreshments and snacks. The viewports provided the only illumination, blazing white with the bright sky outside. Lining the viewports were a variety of chairs comfortable to a mix of species. Moving to the viewports, he saw that the whole speeder course lay out before him. Despite the viewing box's location half-way up the grand spectator concourse, the massive oval of the track stretched out and disappeared near the horizon before reappearing and curving back on their left. Suddenly, a sensation swept over him, and found himself turning to meet Cragus as he advanced from the darkened corner. Slen'da momentarily startled, smiled and bowed his head. "I believed myself alone. Now I realize the bright sunlight had blinded me to the shadows in the room. Greetings, Cragus 12, you are a cautious man." Muted by the viewports, the speeder races were well underway. Cragus and Slen'da however, barely noticed as they laid out their plans, and privately assessed each other. Slen'da noticed several things about Cragus; first was his appearance. Outwardly, this man was immensely strong, an though of average Human height, his basic vitality, athleticism and alertness made him seem taller. His chrome armour covered most of the Cragus's vitals, and so he could not confirm the Intelligence reports that Cragus 12 had taken on more cybernetic parts than his forearm blaster. The armour also showed that a lifetime of bounty hunting was not always lucrative; though in good condition and well maintained, it showed wear, and polishing and buffing did not completely hide the scratches, dents and scrapes from a lifetime of violence. His impressions of Cragus's violent past and indeed, his state of mind were confirmed by the very first thing Cragus had said to him, coming out of the shadows in the corner of the room. "I had to be sure this wasn't a Republic mantrap." For good reason. According to both New Republic Intelligence and Jedi sources, Cragus was a marked man, and the notorious bounty hunter undoubtedly had hunters of his own on his trail. Cragus had to be cautious, and ready for violence at any time. It would undoubtedly cause obstacles and complications during their own hunt for Aach Een. Slen'da could already foresee that he would need to defend Cragus against these hunters, or even get caught up in one of Cragus's decades-old grudge matches. There was something a little more troubling; Cragus had a diminished presence in the Force. Perhaps the infusion of cybernetics in Cragus body, or perhaps it was the decades of his bounty hunter lifestyle the man's presence and.. spirit was reduced in the Force, and was what could only be described as tainted. Not for the first time since his dealings with Calrissian, Slen'da seriously considered what he was getting into. There was no doubt that this man was dangerous, perhaps unreliable, and perhaps even unstable. But this man knew the people and places that Slen'da could use to track down the killers of his friends, of his colleagues. Although it was against his Jedi teachings, perhaps the ends justify the means. For his part, Cragus had already sized up the Bothan. 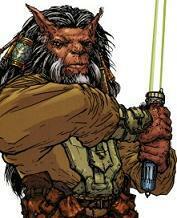 Cragus had done his own homework; before him stood one of the few Bothan Jedi in the galaxy. In many ways, the Bothan offended his sensibilities. In the distant past, Cragus was raised in the COMPNOR-era of the Galactic Empire, and despite working for decades in the worst depths criminality of villany in the galaxy, despite enhancing his natural human body with with cyborg implants, despite working for or fighting against some the galaxy's worst nonhuman scum, he still held anti-alien views. And before him stood everything that COMPNOR had instilled in him to be against; an alien, a Jedi religious freak, and an agent of the chaos that was the New Republic. Any way you looked at him, there was something wrong with him. And although his helmet scrubbed most of the scents, he still thought he could smell the stink of the Bothan. The golden-brown furred Bothan stood in a traditional brown Bothan tunic; altered slightly to meet it's needs as a Jedi religious freak and as some sort of scientist. His movements were calm and steady, his stance was erect and those golden eyes-flecked with violet looked, and for a Bothan, slightly intelligent. A lightsaber hung inconspiciously from a utility belt against his side, and the belt held many bulging pockets, presumably datapads or other scientific gear. Cragus considered his options; and as he admitted frankly to himself, he did not have many. He had to take this Bothan along on the hunt. But there were benefits. While with Slen'da, he could easily re-enter Republic space. And perhaps the Bothan could access areas that were not available to Cragus; things that could make this hunt easier such as access to the Jedi archives, or New Republic Intelligence or even the Bothan SpyNet. Also, Calrissian had mentioned that this Slen'da held a deep grudge towards the men they were to track, and from past experience, a Bothan vendetta was not something to underestimate. In short, aside from the blood vengeance, he was different in almost every imaginable way from the Bothan Jedi. And he had a feeling that while he would work with this Bothan, like he had other aliens, he wasn't going to like it... or it. A good question, Slen'da considered, and a loaded one. On the face of it, there was actually nothing that connected the two cases together, and Cragus had already pointed that out. They reviewed the holotapes; the first of the Rafa IV massacre, and then the break-in on Kelada; they also skimmed the biased Centran report, the more factual New Republic report of the massacres, and finally Calrissian's summary of facts, events. All they had left was a few notes and tips compiled by Calrissian, and their own hunches. If they started on Calrissian's tips, they would move even further away from the Rafa IV killers. Slen'da fought his frustration through his connection in the Force, fighting for inner balance. He sat one more moment, and then spoke aloud. "Well, we have various leads. We could try to track down Aach Een, but we have nowhere to start with him. We can track down any of the droids stolen from Rafa that may have reappeared on the black market, and work our way from there. We can also backtrack Calrissian's tip that somebody had be inquiring among the galactic black market channels about the Amulet of Kalara. For that, we could start in on the infochants by hiring a slicer, and then follow the holotrail." Cragus made up his mind quickly, and spoke bluntly. "I'm on Calrissian's payroll, so we will start on tracking the infochants. I don't know what the Force told you about our two cases being mixed up, but I don't see it or buy into your Jedi guesswork. And as it happens, I have a contact with a slicer.. one that I trust. Slen'da, despite personal reservations, acquiesed. "Well, every journey has a beginning. We may as well start with the slicer. Where can we contact them." Despite Cragus's facial expression being covered by the armour, Slen'da sensed.. embarrassment? Uneasiness? "She is in.. Republic Space, unfortunately." "You are aware of the bounties on my head? Then I cannot take my ship in. These days, despite my modifications, there are very few of it's type anywhere in the Galaxy. We will have to use yours." Although it was a good cover, Slen'da still felt the uneasiness radiate off the man. There was something else going on.